A bright and cheerful outdoor welcome sign designed to greet children, parents and visitors to nurseries, pre-schools and primary schools. 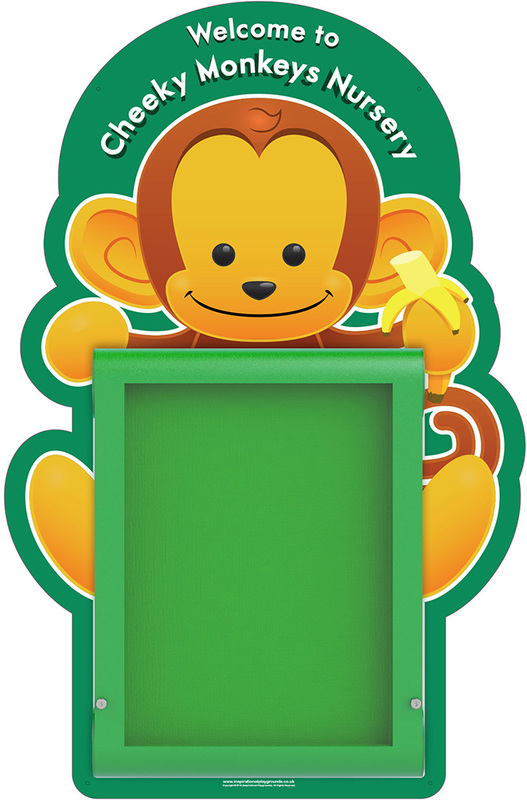 This outdoor notice board includes a fully weatherproof notice board and a printed back board with monkey design. The back board is printed on a rigid, heavy duty plastic panel which is UV light and weather resistant so is designed for use outdoors. The ‘Welcome to’ message is personalised by adding wording of your choice. Due to space restrictions, a maximum of 30 characters can be printed. The external notice board is attached in front of the back board. This notice board is fully weather proof as the double door seal and enclosed case prevents penetration from rain or moisture. It has been tested to, and complies with, test IP55 for dust and water ingress. An aluminium frame, powder coated with a green finish, this notice board has a green felt pin board interior so is easy to use pins to display information and notices. The core and fabric of the notice board is fire rated and complies to Fire Retardant Class 0 and BSEN13501:2002. The outdoor notice board door is made from virtually shatterproof polycarbonate which is fire rated. It is hinged along the top edge and opens to a 90o angle for easy access. Twin gas struts assist with easy opening. The door has two locks so can be locked to prevent tampering with contents. The notice board will display up to 4x A4 sheets in portrait orientation and is fixed in a portrait position in front of the back board.